If you see Hummingbirds in Ontario, you can be sure they are members of the Ruby Throated variety (Archilochus colubris) as they are the only species native to Eastern Canada. With one of the longest migration paths of any of the hummingbirds, these tiny birds fly south each Autumn to reach their wintering areas in Mexico and Central America. It used to be thought that these tiny birds could not fly cross the Gulf of Mexico, because the demands of a 500-mile journey were beyond the capabilities of such a small bird. Later, researchers believed that these birds put on enough fat before migration to meet the demands of such a flight. It is now known that at least some of the population makes the southward, autumn flight, over water, from Florida to the Yucatan peninsula. The majority of these birds, however, migrate around the Gulf of Mexico, through Texas and northern Mexico to winter in Central America as far south as Panama. In the spring-time, the males return to the north before the females do, and they immediately establish foraging territories. Their food is nectar from flowers and flowering trees, but their diet can occasionally include small insects and tree sap taken from woodpecker drilling. Hummingbirds show a preference for red, tubular flowers as a nectar source from which they feed using a long extendable tongue. 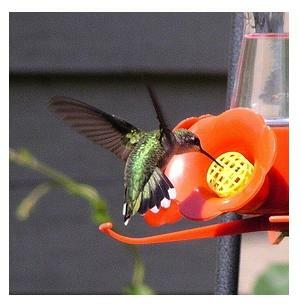 When buying a hummingbird feeder, they often come in the colour red as it attracts the birds to the nectar inside. Guests who stay at our Holiday Home frequently see these spectacular birds when they visit the feeders for nectar, sometimes up to 50 - 100 times a day. Often when there is more than one hummer at the feeder, they bicker and squabble with each other, emitting tiny squeaks and squeals as they vie with each other for the best place to sip the nectar. If you have never seen one of these lovely birds - you are in for a treat! Just fill up the bird-feeder with nectar, pour yourself a drink, watch carefully and prepare to be amazed! When they arrive in their breeding area, the females construct their tiny nest out of leafy material and scales, held together with silk from spider webs or tent caterpillar nests and decorated with lichens. Their nests, which are built on downward-sloping limbs that are overhung by other branches, are sometimes reused from the previous year. In the picture above, you can see that when in flight, the camera catches only a blur of wings as they beat up to 80 times per second. Once the female has made her tiny nest, she is ready to engage in courtship with the male. Sometimes the pair engages in a mutual up-and-down mating flight. After a few days, the pair dissolves and the female incubates the two bean-sized eggs and feeds the hatchlings by herself. Even though young hummers are born naked, blind and helpless, after about three weeks, they are ready to leave the nest. 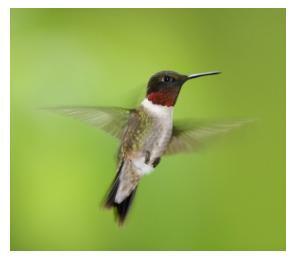 Hummingbirds - click on this site of the Cornell Lab of Ornithology to hear the sounds of the Humming-birds, "les colibris" - both their chirps and the steady hum of their wing-beats from which the Humming bird gets its name. 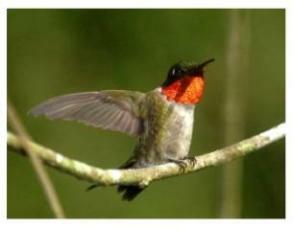 Ruby-throated Hummingbird could be mistaken for one of the larger moths that also hovers before flowers during the day. It is among the smallest of North American hummingbirds, measuring only three to three and a half inches in length from beak to tail, with a wingspan of four to four and a half inches. Both sexes are a metallic bronze-green on the crown, nape, back, rump, and middle two tail feathers. Males are gray below with green flanks and sides and females are gray with brownish flanks, and the wings and outer tail feathers. The picture, above, clearly shows the female's rounded tail and white tips of the outer tail feathers, whereas, the male's tail lacks the white and is slightly notched. Males have brilliant red throat feathers, which, when seen from the side may appear golden or greenish. Do you have a story about Hummingbirds? We'd love to hear your interesting story or observation about your Hummingbird experience! Please share it with our readers! TIP: Since most people scan Web pages, include your best thoughts in your first paragraph - tell us where you saw the Hummingbird, what time of day, and what the bird was doing. Ruby throated Hummingbirds in Kanata Lakes, On. A regular visitor to our Georgetown garden. Thanks for the lovely picture, is that a female Ruby Throated Hummingbird?